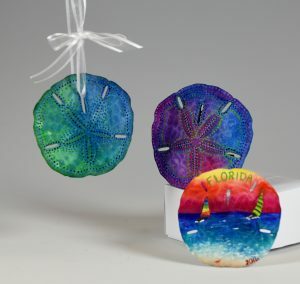 Create your own magnets and ornaments from sand dollars. Using acrylic and/or watercolor, paint up to three sand dollars with beach scenes, patterns, washes… whatever you want! When you’re finished creating, turn your artwork into a magnet, ornament, or both. Perfect for gifts or fun mementos of your time in St. Petersburg. Sand dollars and supplies included. No painting experience necessary.